For many of us who live in cities or suburbs, doctors and hospitals are plentiful and nearby. That’s not true for much of rural America, where medical care can be harder to come by. New broadband technology could help bridge that gap, providing care to people everywhere, but it’s of little use if the folks who need it most aren’t able to get online. There are a lot of things medical professionals can do for you without necessarily needing to be in the same room as you. That’s where telehealth comes in: If your doctor can see and talk to you over video conference and get your basic vitals remotely, then there are a fair number of things they can do for you while you’re still comfortably at home. Successful telehealth requires a good, solid, stable broadband connection. And the parts of the country where it could be most useful — rural areas, where getting to a doctor or hospital is challenging and time-consuming — are in many cases the same parts of the country where broadband is also lacking. 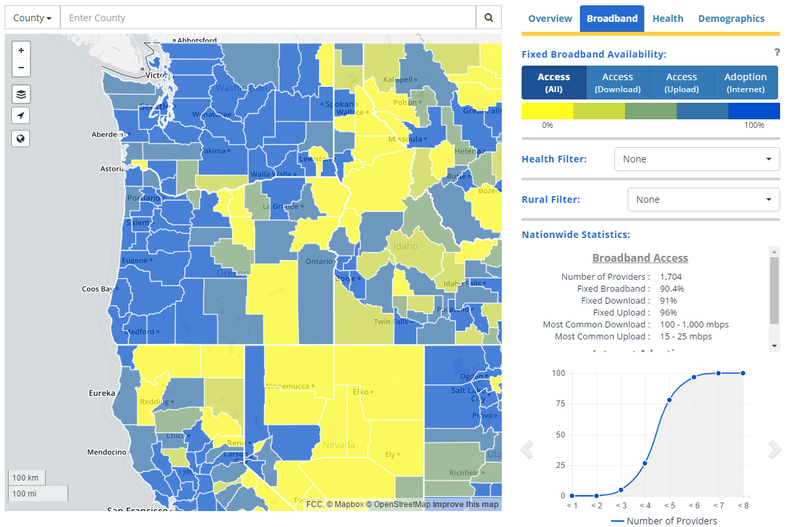 So the FCC has a task force, called Connect2Health, dedicated to sorting out where low broadband access and negative health outcomes correlate, and trying to find solutions to bring more robust health care access to those areas. 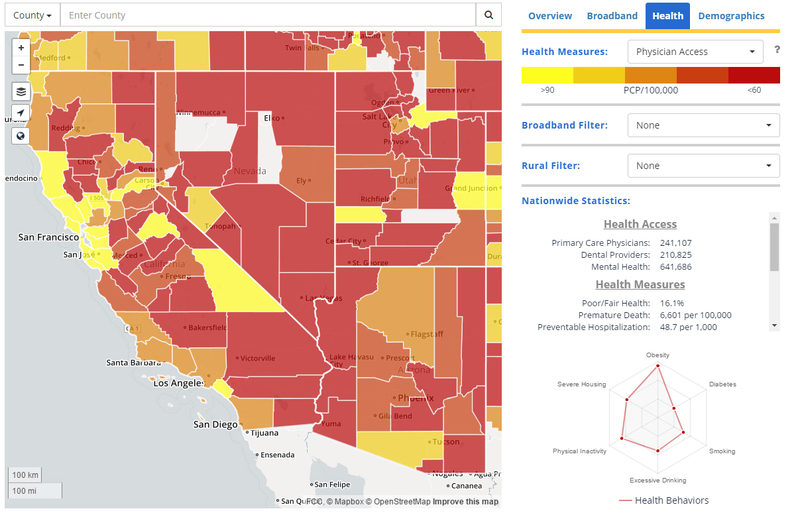 The Connect2Health task force this week has unveiled its new mapping platform, sensibly called Mapping Broadband Health in America. The map tool measures a few different things. 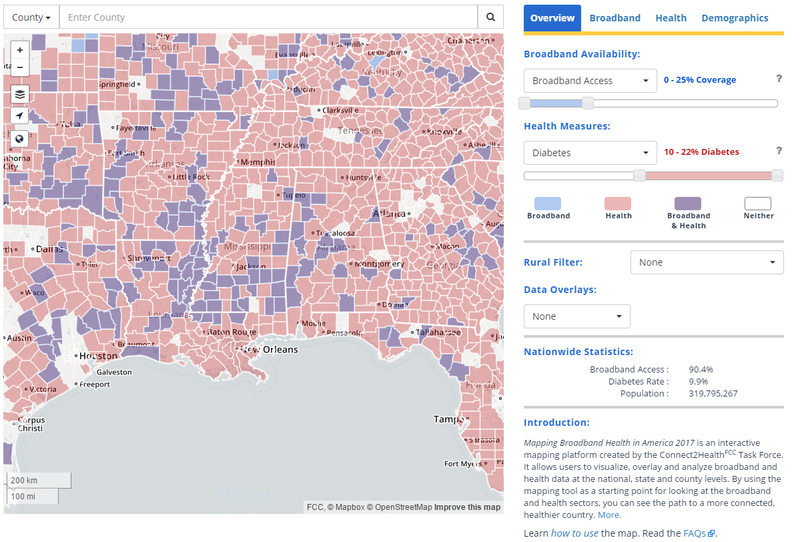 One is broadband penetration: it shows you which counties people are more or less likely to have a high-speed connection in. But it also measures certain healthcare outcomes: diabetes prevalence, obesity prevalence, “poor health” prevalence, access to physicians, preventable hospitalizations, and sick days used. The maps also have layers available for some basic demographic data, including education levels, unemployment levels, and average age of the population in a given county. The idea is that you can overlay information about all these different metrics onto the same map, and then look for correlations. If you see places where the health outcomes are worse and broadband penetration is low, then those can be areas that Federal programs target. You can browse the maps to get a good high-level overview of the data. You can set filters to see the situation in any given state. Yellow areas mean few people have broadband access; blue areas mean people largely do have access. The more yellow a county is, the more primary care doctors serve the area; the redder the county, the fewer doctors there are. When you look at two outcomes at once, you start to see which areas are hardest-hit. For example, this map, looking at the Southeast, shows where broadband access and diabetes are striking the same population. Red counties have high incidence of diabetes diagnosis; blue counties have very low broadband access; purple counties are “double burden” areas, hit with both. Red counties have high incidence of diabetes diagnosis; blue counties have very low broadband access; purple counties are “double burden” areas, hit with both. Agencies, nonprofits, and anyone else who wants to can also download the nationwide, state-level, and county-level data sets to create their own tools. In its initial analysis, the FCC’s task force found that nearly half of U.S. counties overall have a “double burden,” ranking low on broadband access and high on chronic disease. The “double burden” problem falls hardest on rural communities: over 60% of rural Americans live in one of those counties, the task force notes, while less than 5% of those in urban areas do. Commissioner Mignon Clyburn said in a statement yesterday that outside of D.C., “hundreds of federal, state, and local stakeholders” all wanted help to “better leverage broadband as an essential health tool.” Making the baseline data widely available is just the first step in that process.